Posted on Tuesday, March 3rd, 2015 at 23:00. 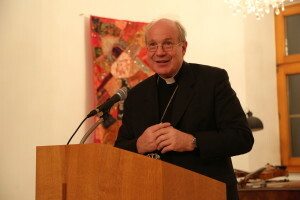 Last week, on February 25, the ITI had the great privilege of an evening lecture on the Prima Pars Quaestio of the Summa theologica by St. Thomas Aquinas, held by our Grand Chancellor Cardinal Dr. Christoph Schönborn. Before being appointed bishop many years ago, Fr. Christoph Schönborn, O.P. was a professor of theology and a very good one at that. Not only does the Cardinal have a vast teaching experience and many publications on his name, he is above all a teacher with a great love for teaching, who also has a deep knowledge of the great Doctor of the Church, St. Thomas Aquinas, one of the patron Saints of the ITI. The task of Theology thus is to serve the Kingdom of God that is being established on Earth through the faith of the faithful. At the ITI we do this by forming the minds and the hearts of men and women that can engage with the world and show it the light of Christ in all its brightness. It easily becomes clear when we look at the great suffering all around us, near and far, how much a serving theology is called for to heal the many wounds and to give hope. As St. Thomas says: “..yet the slenderest knowledge that may be obtained of the highest things is more desirable than the most certain knowledge obtained of lesser things..” It is the hope that lies in these highest things that Theology is called to provide to all people of all nations.